Congratulations, Louis, for earning your letter jacket! Louis's host mom, Laura Burrum, sent the following to the Clarkston Rotary Club in December. "Louis is a fantastic kid...that has recently made a great accomplishment by any 16 year old standard. 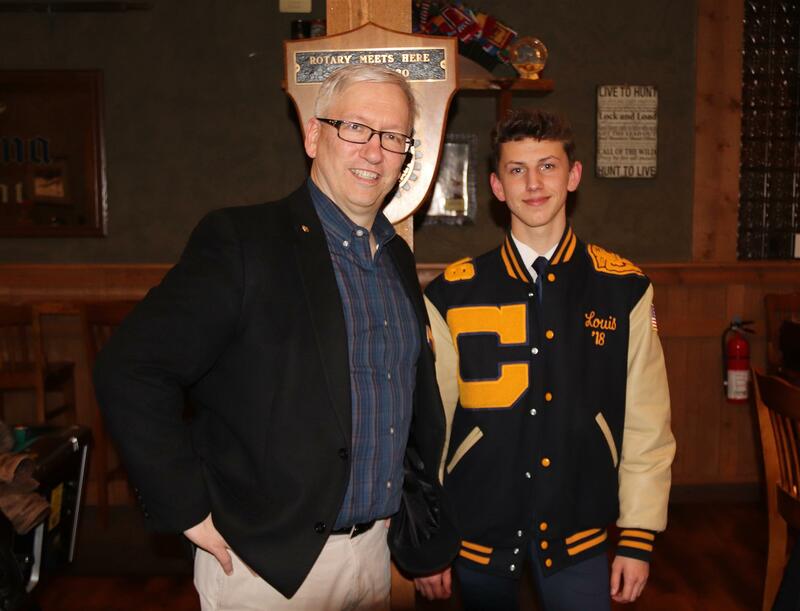 He received his Clarkston Varsity Letter in Cross Country Running. His personal record was a 5k in 19:11. He improved 4.93% through his season. Clarkston has an incredible cross country team and because of that the requirements to acquire a letter is difficult and challenging. Varsity letters and Varsity Jackets are not heard of in France and Louis really really really wants this badge of honor on a Clarkston jacket. Louis is not the kind of kid that asks for much of anything and appreciates everything!" So on Monday evening, with many of his host parents, host siblings, Rotary counselor and friends in attendance, Louis received his jacket. What a great evening. The club thanks its Youth Exchange team from the club and the support from the community for this great opportunity.